When you first decide to travel over the holidays, the idea sounds wonderful. Just a few days off of work to relax, reconnect with friends and family, and recharge from the grind of life. However, once you get to planning, you quickly remember how stressful traveling during the holidays can be. And, unfortunately, you aren’t the only one with travel on the mind so prices tend to be at their highest around those peak vacation times. Whether it’s by plane, train or car, getting to your holiday destination can result in expensive ticket purchases, gas bills, hotel accommodations and, potentially the highest cost of all, stress! 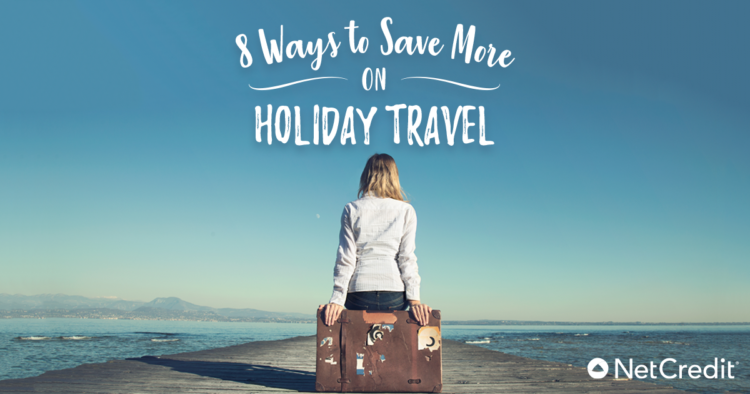 In order to help you avoid stress and get the biggest bang for your holiday buck, we spoke with experts and avid travelers to learn their best holiday travel tips. You don’t need to stay at name brand hotels when you go away. Oftentimes, you pay more for the name than you would for a “mom and pop hotel” that is sufficient for your needs. Chances are you won’t be in your room most of the time anyway, so there isn’t much need to spring for a nicer room when all you’ll use are the basics. Don’t forget to check out budget options like Airbnb. This can be especially great for solo travelers, with cheap options like shared rooms and private rooms. “Granola bars, juice boxes, sodas, pre-washed fruit, candy, chips… the savings can really add up if you normally buy a snack every time you stop for gas or have a layover,” Abbie Unger explains. If you happen to be attending a sporting event or theme park, there are certain items that are allowed in. Check their website before you go and save on overpriced snacks. “Always book online so you can save money with online coupon codes,” Jon Lal of BeFrugal.com suggests. You can search for promo codes or install a plugin like Honey, which automatically applies the best promo code available for your purchase right at the checkout. You can also earn cash back on travel booking website with the Ebates plugin. Jon Lal notes, “Each airline has different fees for add-ons, so look before booking to avoid any potential fees. There is an Airline Fees Chart provided by Kayak.com and an Airline Fees Guide created by Smarter Travel.” This is especially helpful for budget carriers like Spirit, Frontier, etc. When you’re looking at the prices side-by-side, they appear cheaper than carriers like Delta, American, United, etc. However, if you include the additional fees of taking a carry-on, choosing your seat, etc. you may end up spending more in the end! “Some airlines charge you for each bag you pack, so if you are traveling by plane, consider giving gift cards or other small items as gifts,” Cathi Brese Doebler suggests. “This will help you avoid having to travel with large gifts that can take up luggage space and add to your luggage transport costs.” If gift cards aren’t your thing, check the cost of shipping your gifts to the destination versus the cost of checking another bag. You could also purchase your gifts online and set your destination as the delivery address.